And once the letters had been cut, the writer took a handful of ash and rubbed it into the thinly-incised letters to make them stand out more clearly. Interestingly, the very way in which the letters were formed meant that Western observers were thoroughly confused: in which direction was the Baybayin written, and in which should it be read? Some thought the text should be read vertically from bottom to top in columns progressing from left to right because that was how the ancient Filipinos carved it. This writing process, though, had nothing to do with linguistics and everything to do with occupational safety. Given that they were carving with a sharp tool on an irregular and non-flat surface, they carved away from their bodies. This actually gave them the unusual ability to read and write in different directions and from different angles. To add to the confusion, mirror writing was common, so it was not unusual to see left-handed and right-handed versions of the same letter. 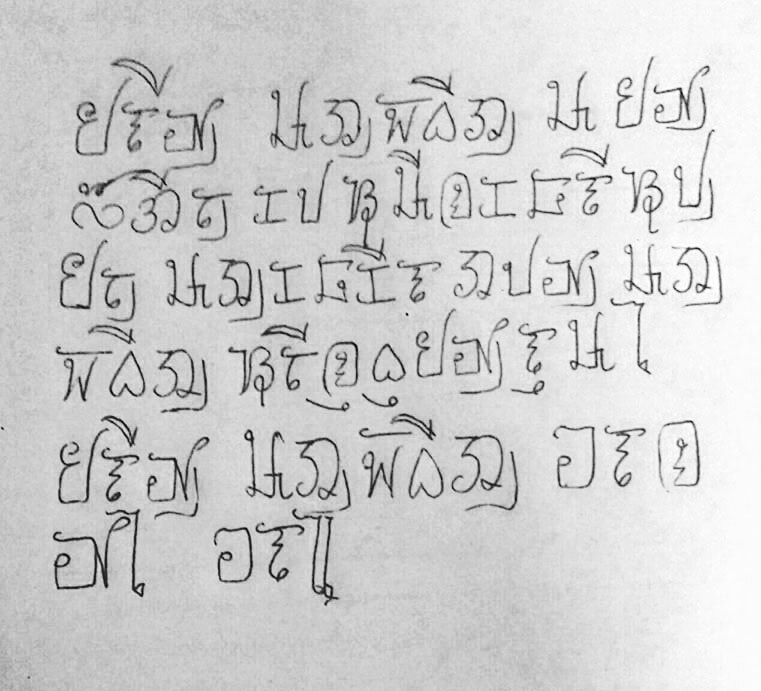 Once the Spanish arrived, Baybayin was doomed to the long, slow decline of a minority writing system. In short order, printing presses were set up and Filipinos adopted the use of pen, paper and ink, so the technological basis for their written language, and thus its very look, was lost. Even though the Spanish friars adapted Baybayin for printing and used it to teach Christianity to the Filipinos (and to teach other clerics how to speak the local languages), it began to lose headway in the 1600s. 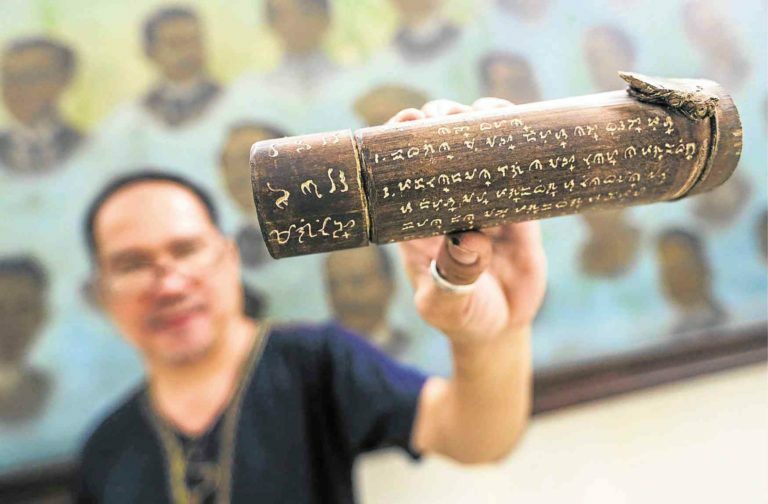 Filipinos continued to sign their names with Baybayin letters throughout the 17th, and even into the 18th century, but most documents were written in Spanish. Baybayin declined in part because it couldn’t handle the new Spanish-influenced sounds that were making their way into Tagalog: it couldn’t distinguish, for example, between the vowels i and e, or u and o, or the consonants d and r.
All the same, the Baybayin never quite died out, and today a variety of people are doing what they can to revive it. Baybayin tattoos are returning as signs of cultural pride, and overall cool. 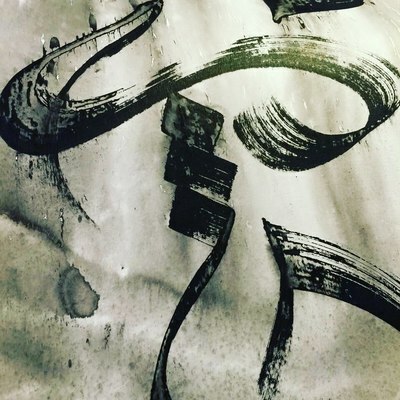 One artist, Kristian Kabuay, has expanded his repertoire to include calligraphy, graffiti, and custom artwork — a panorama of Baybayin. 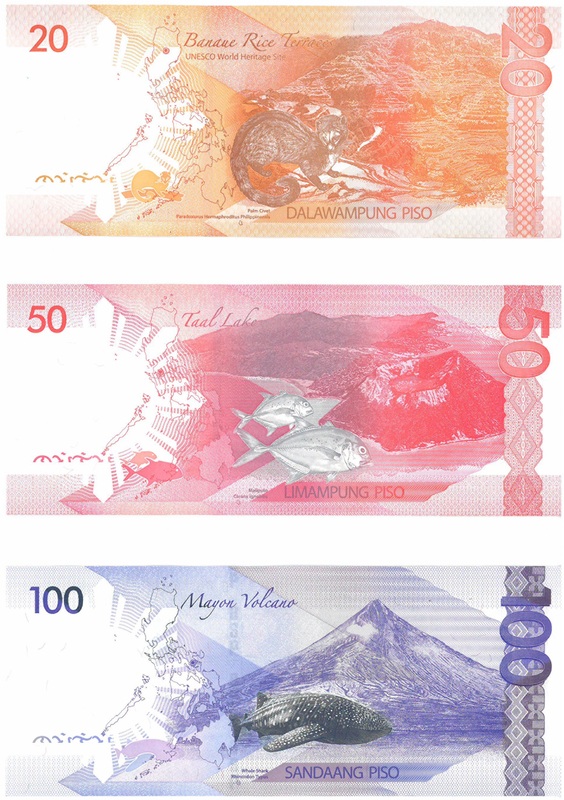 Meanwhile, the Philippine government has added Baybayin symbols to the country’s peso banknotes as an anti-counterfeiting measure. 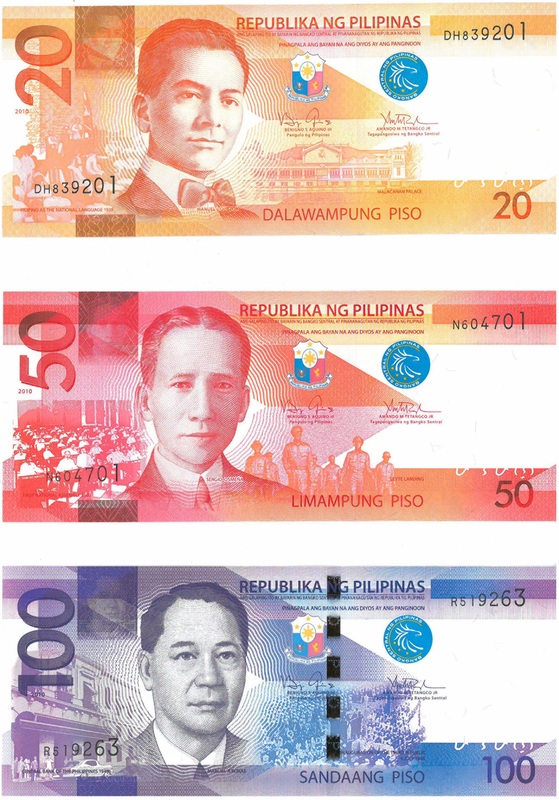 What could be a stronger sign of acceptance than having a script literally backed by the nation’s currency? Ensuring the proper record-keeping of relevant documents and preservation of oral evidence on the writing systems. There has also been discussion of specific ways of implementing traditional writing systems into commercial and administrative daily life, by requiring: all manufacturers of locally produced processed food products to inscribe local scripts and their translation on the containers of labels; local government to include the appropriate local signage for street names, public facilities, public buildings, and other necessary signage for other public service establishments like hospitals, fire and police stations, community centers and government halls; newspaper and magazine publishers to include an indigenous-script translation; and the dissemination of knowledge and information about local scripts by distributing reading materials in all levels of public and private educational institutions and government and private agencies and offices. It is very, very unusual for any government to view its own indigenous people and their writing systems with such respect, and to propose such far-reaching legislation. The legislation is still a long way from being concluded and enacted, but the Philippines may be showing the world the way ahead.